One of Mexico's most hauntingly beautiful and famous holidays is la Dia de los Muertos, or the Day of the Dead. Occurring at the beginning of November, Mexicans everywhere honor their deceased loved ones by preparing some of their favorite dishes. Here Marcela will host a party and serve up some rich and comforting dishes that remind her of relatives who are no longer with her. Like salmon baked in corn husks with mushroom rice, pork-stuffed chiles in a white walnut sauce, Baja shrimp sauteed in white wine, and a traditional pecan pie made with spiced Mexican chocolate. 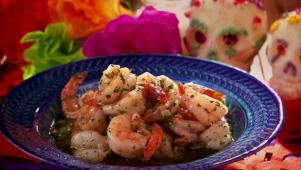 Baja Garlic Shrimp is a yummy addition to Marcela's Day of the Dead feast. Stuffed Poblano Chiles honor Marcela's mother on the Day of the Dead. 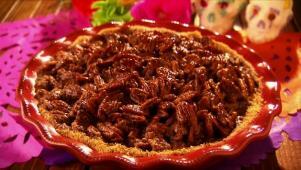 Mexican Chocolate Pecan Pie is Marcela's special Day of the Dead dessert. 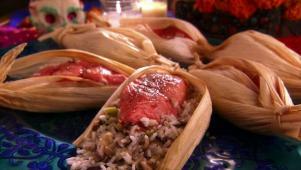 Salmon in Cornhusks is a perfect main dish for Day of the Dead or any day.